CELEBRITY Cruises has introduced their newest ship, Celebrity Edge, which claims to change the way guests experience the world. It is cruising the Caribbean as we speak and will be stationed in the Caribbean for the summer. Every time a cruise line launches a new class of ships, and that doesn’t happen very often, it is an opportunity to impress and Celebrity Edge does just that. The first in Celebrity Cruises’ new Edge class of ships, it promises an assortment of firsts for the industry and the world. 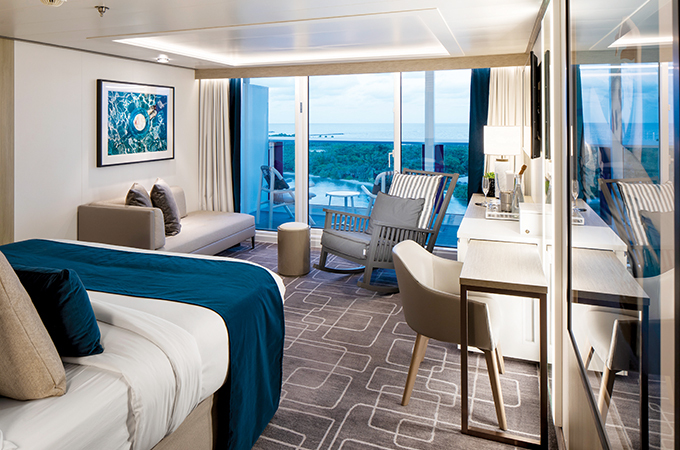 Celebrity Edge boasts a refined, outward-facing design, new suite categories and iconic, never-before seen stateroom designs. Celebrity Edge is 29,500 GRT, 1,004 feet long and 128 feet wide. It can host up to 2,918 guests on double occupancy, 3,373 guests in total and 1,320 crew. The ship has a total number of 1,467 staterooms. Each stateroom is 23 per cent larger in size and the bathrooms are 10 per cent wider than their previous solstice class. Making it easier for family and friends to get away, Celebrity Edge boasts their latest category of suites, the two-level Edge Villas, which offer stunning, outward-facing views, private plunge pools and direct walk-out access to The Retreat Sundeck, a convenience reserved exclusively for Edge Villa guests. With two stories of windows in the two-level atrium stairway that look out over the terrace, featuring a three-foot-deep plunge pool and inviting lounge furniture, to the incredible ocean views from even the bathroom, it’s an open and airy environment that truly invites the outside in, and vice versa. Guests staying in an Edge Villa will also enjoy personal butler service and access to The Retreat. Every villa will enjoy a butler service and is fitted with plush king-sized cashmere mattresses that is handcrafted, hypoallergenic, eco-friendly, and eucalyptus-treated. Featuring the first dining venue of its kind is the Magic Carpet restaurant that is perched on the side of the ship and moves up and down between 13 stories. The Magic Carpet makes Celebrity Edge’s distinctive, sleek profile recognisable from miles away. With its stunning, open-air panoramic, outward-facing ocean views, Magic Carpet is designed with a yacht-like, breezy, and casual vibe, with comfortable seating, a full bar, and space for live music performances, making it the place to see and be seen. When situated on the summit of the ship on Deck 16, the Magic Carpet becomes the ultimate specialty restaurant high in the sky where mouthwatering experiences such as “Dinner on the Edge” are hosted for a select number of guests. When it moves down to Deck 14, Magic Carpet becomes an extension of the already expansive relaxing main pool area, the perfect place for breathtaking views, tantalizing libations, and live music. When moved to Deck 5, Magic Carpet extends the ship’s restaurants into the most amazing al fresco seating imaginable for close to 100 guests. Here it creates an intimate, open-air dining experience that will make the fresh ocean fare taste even fresher. At the bottom, Deck 2, Magic Carpet hovers within a hair above the ocean surface and becomes an extension of the Destination Gateway, a new area that becomes a luxury embarkation station where guests will be whisked away aboard our newly redefined Edge Launches. Celebrity Edge will be stationed in the Caribbean for the winter until April, after which she will be stationed in the Mediterranean for 7 to 14-night summer itineraries.